At the heart of the sorting circuit currently lies two TOMRA sensor-based sorters – COMBISENSE and X-TRACT – for metals cleaning, mixed metals sorting, aluminum upgrading and quality control of various shredded aluminum feed material. At the heart of the sorting circuit currently lies two TOMRA sensor-based sorters - COMBISENSE and X-TRACT - for metals cleaning, mixed metals sorting, aluminum upgrading and quality control of various shredded aluminum feed material. In Q4 of 2018, WENDT will install a separate line featuring the combination unit of WENDT/TOMRA FINDER with new LOD (laser object detection). "WENDT introduced its new metal sorting plant at a critical juncture in the market, given the increased purity standards for a number of scrap products and inability for scrap recyclers to sell material to China. The plant output is high-quality, furnace-ready material, and it allows operations to test their material to ensure they are installing the right sorting technology to increase final product purity, maximize profit potential and minimize investment risk," says Eric Thurston, sales manager metals - recycling for TOMRA Sorting Recycling. "This is why they are the leader in the scrap industry, and why TOMRA values our critical partnership with WENDT in the post-shredder ELV (end of life vehicle) industry." X-TRACT offers high-speed X-ray transmission (XRT) with DUOLINE® technology to deliver superior recognition of secondary resources, regardless of material density. The specialized TOMRA COMBISENSE sorts by color and shape to separate high purity metal fractions from even the most difficult feed material. It combines a color sensor with SUPPIX® image processing technology that enhances resolution levels by a factor of eight to reduce lost product yield. "With COMBISENSE, customers can make a clean white heavy package or clean red heavy packages like copper, brass, and printed circuit boards (PCBs). They can also separate materials further, depending on market demands," adds Thurston. X-TRACT offers high-speed X-ray transmission (XRT) with DUOLINE® technology to deliver superior recognition of secondary resources, regardless of material density. Exceptional resolution is achieved to efficiently sort even the most varied metals mix with the smallest grain size. With XRT, customers can create a clean twitch product or separate wrought and cast packages for furnace-ready material for smelters. LOD allows black rubber, glass and plastic to be separated from zorba and zurik products, which enables these commodities to be turned into a cleaner, more valuable revenue stream. 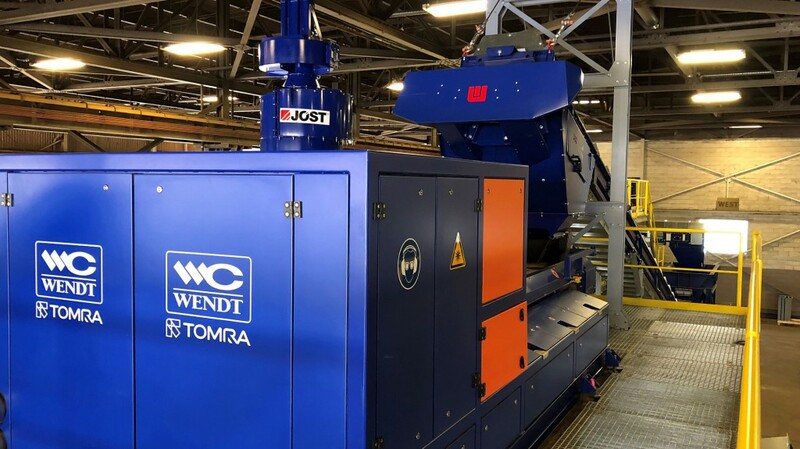 Introduced in early 2018 to help operations meet stringent standards like National Sword and soon to be added to the new WENDT sorting plant, TOMRA LOD mounts to the same platform as FINDER to boost a circuit's sorting capabilities without requiring additional floor space. Featuring laser technology, LOD identifies black objects attached to metal material detected by the FINDER's EM3 sensor. LOD allows black rubber, glass and plastic to be separated from zorba and zurik products, which enables these commodities to be turned into a cleaner, more valuable revenue stream. The new WENDT metal sorting plant is now open for appointments for customers to test feed material.